A mother and her child wait to see a nurse at Kawale Clinic in Lilongwe, Malawi (file photo). Policymakers, donors and international agencies have, for decades, emphasised the need to prioritise women's health services - for their own health as well as their children's. While there is an increasing awareness of - and concern about - the fact that men's health has been neglected, global money, international and national priorities continue to focus on the health of women and children. And it's working. 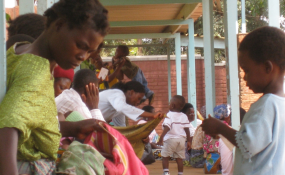 In Malawi, where we (a group of public health and sociology researchers) work, waiting rooms are filled with young women, mothers and children seeking routine health services such as family planning, prenatal care and immunisations. Women are deeply engaged in the health system. As a result, clinics have a distinctly feminine flavour, often characterised by groups of women and their children receiving health education and singing songs about reproductive health or immunisation strategies. We recently completed a study on health service recommendations for young adults (aged between 18 and 35) in Malawi. We wanted to establish what these recommendations mean - in terms of commitment - for women's time versus men's time. What we found provides a unique perspective on the complex realities of health services, and the potential unintended consequences of focusing routine health care almost exclusively on women. These consequences may actually detract from gender equality for women, as well as from men's health. Malawi's health service guidelines recommend that young women receive multiple health services: 10 times a year when they are pregnant, up to 17 times a year if they have a young child, and between four and 12 times a year for family planning. These figures only refer to routine health services, and exclude many illnesses such as malaria or respiratory infections which are common in the country and require additional visits. These routine health services add up during a woman's reproductive years. In countries with high fertility - women in Malawi have an average of 4.4 children - women spend much of their young adult lives pregnant or with young children. As a result, they are constantly using health services. We found that women in Malawi living with HIV would need the equivalent of one working day each month to meet routine health service guidelines. This is more than the average US worker receives annually in paid sick leave. It constitutes significant time that is lost to women's employment, school and leisure. Additionally, we found that women spent six times as long seeking health services as men did. This increased time burden could deepen existing gender inequalities and limit women's success outside the home. By excluding men from routine health services, the health system perpetuates the "tough man" mentality and reinforces notions that men should wait until they get ill before seeking care. Men's poor use of health services has major implications for their health and - ultima tely - their lives. Men have a greater burden of nearly all major diseases in Malawi. Health service guidelines must be revised to reduce the time burden on women, and to include a focus on men's health. Existing proposals to integrate and offer outreach of routine services for women need to be implemented. At the same time, strategies to engage men must be taken up urgently. These include the provision of broader male-friendly health services that are available after hours, quick, private, and outside female-focused settings. For these changes to be successful, donors and international agencies must address their blindness towards men's health and the time burden placed on women.